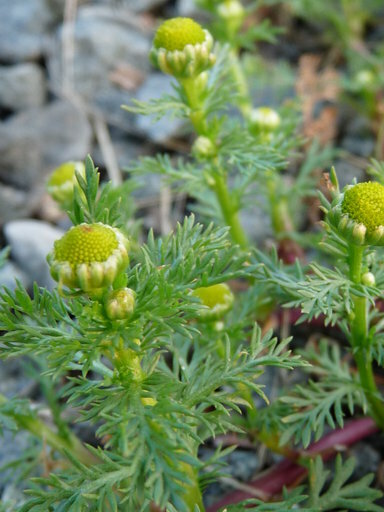 Often mistaken for chamomile, pineapple weed is a close sister and is an annual plant. It grows from May to September. Pineapple weed may be confused with young mayweed chamomile; however the mayweed does not emit a pineapple-like odour when crushed. 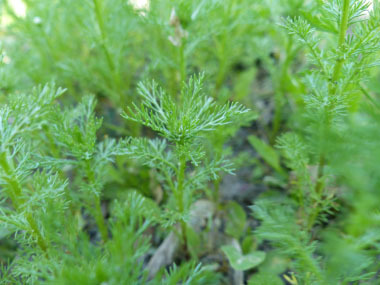 Additionally, mayweed chamomile grows much taller than pineapple weed. This wild edible weed grows in many countries in the northern and southern hemisphere and in some places is nicknamed the "street weed". Distinguishing Features: Pineapple weed looks like chamomile only without the flower petals. It is a low-growing plant with finely divided foliage that gives off a pineapple smell when crushed. 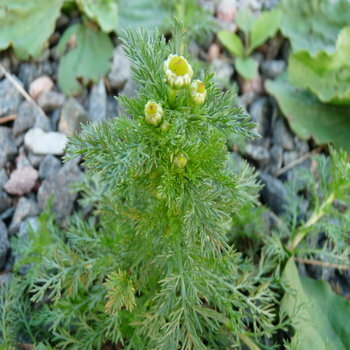 Fields of Nutrition has medicinal benefits and vitamin/mineral content of Pineapple Weed. 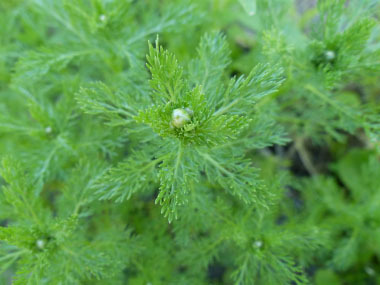 Leaves: Pineapple weed leaves are finely divided into narrow, feathery segments. They grow alternatively along the stem and average from 2 – 4cm. long. Leaves are hairless. Height: This plant grows to about 30 centimetres tall. Habitat: Pineapple weed grows in almost all waste areas and sometimes in between sidewalk cracks. Pineapple weed is an amazing plant which seems to thrive in abused soil such as dirt roads, driveways, and other dry or sandy soil locations. 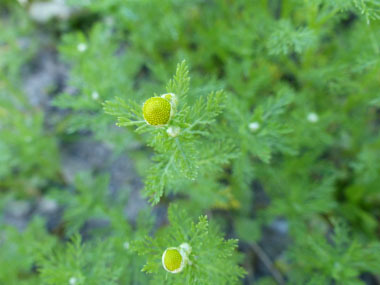 Edible parts: Pineapple weed flower s and leaves are a tasty finger food while hiking or toss in salads. Flowers can also be dried out and crushed so that it can be used as flour. As with chamomile, pineapple weed is very good as a tea. Pineapple weed flowers may become bitter by the time the plant blooms, but are still good to eat. Similar plants: Roman Chamomile, Mayweed Chamomile.